"The 2900 Line: Emphasizing the modern beauty of shaded light. These fixtures are cast in metal and finished in Old Gold with Tan Iridescent Shades." Page 171. Most of these fixtures are missing shades so they are being discarded and not repaired. Inspecting this lamp we notice the wiring looks original and is really stiff. The sockets appear to be in good shape. Since they have the screw terminals we will reuse the sockets. The only lamp parts we need for this repair are lamp cord. We start by removing the cover from the main lamp body to gain access to the wiring. These great old lamps were assembled by hand so all the components are connected with screws and nuts. This makes repair much easier than soldered and stamped parts. Each socket on this lamp is removed and rewired with 9 inch lead wires. For polarity we always say "smooth (black) wire to brass screw and ribbed (white) wire to nickel screw." These older sockets do not have brass or nickel plated screws so you will need to identify the screw related to the center post on the socket. The smooth or black wire connects to the center post screw terminal in the socket for polarity. Since these sockets do not have a cover on the back we use tape. The tape helps keep the socket clean and safe from dusters or some thing else accidentally shorting out the fixture. It is very cost effective too. Each rewired socket is attached back to the lamp cluster plate. The wire from the fixture canopy to the cluster is also being replaced. We are using a twisted cotton covered brown lamp wire to keep a period look. The socket wires and the fixture wire are connected in the cluster area. The black wires connect to the plain brown wire and the white wires connect to the stripped brown wire. The plate is mounted back to the lamp body. Bulbs are added to the lamp and tested. 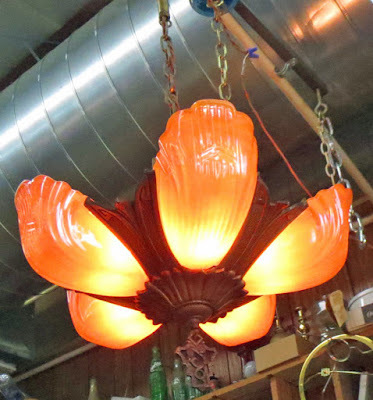 Note: The customer did not have shades for this lamp but was able to buy some from Antique Lamp Supply. The Markel ship shades offered are a nice reproduction from the original shades.